This entry was posted in CRM Blog, CRM Intergations on April 11, 2019 by Mike Nash. If your business moves things from A to B, you’re going to love the new freight system in Web CRM. Making use of existing customer and product data and using our links to MYOB and Xero * we’ll help streamline business operations by reducing redundant data entry, and maintaining accuracy. You’re able to quote either independently, or as part of the selling process as part of raising a quotation or invoice. This means that you are able to include real-time freight pricing in your discussion on the phone with clients. When used with our other features such as accounting and credit card interfaces, this will provide a full process all within one program. Freight cost and sell prices added to quotes/sales/invoices for cost and margin tracking. Use the freight quote later as a consignment. The following carriers are supported. This list is subject to change. * Reckon and EXO supported in Hybrid CRM. This entry was posted in CRM & Accounting, CRM Intergations on March 19, 2018 by David Northmore. If you’re hitting the limits with MYOB but you don’t want to change accounting systems or you’ve just realized that its not a substitute for a CRM. It’s common that people use lots of paper and excel spreadsheets because MYOB doesn’t really have a pick, pack, ship process. MYOB just does the accounts. As a result there can be lots of paper based process, running around with dockets, re-keying data between courier systems, excel, MYOB. Special prices or custom pricing manually handled. Data entered manually into Australia post for labels. Tall emu extends MYOB to deliver some process in the warehouse. Auto printing of delivery label. Transfer consignments automatically into Australia Post, Star Trak, Fastway (can add your courier too). Email to the customer automatically. This entry was posted in CRM Intergations, CRM Software Solutions, Tall Emu CRM on May 18, 2016 by Ivy. We have created a web-based task tracker, built to be used on a Smart Phone or Tablet in your work place. Simply assign tasks to your employees and they appear on the device and can be started, stopped and checked off. The time is automatically logged against the task. We initially built this to control the operations of a nationwide catering companies’ kitchens, but it is broadly applicable to any manufacturing organisation where jobs are created and need to be time-tracked and checked off as they are completed. Provides a way of allocating tasks. Every staff member will now have their own to-do list, and the todo list can be generated (with customisation) based on your own business rules. You can now Track how long an actual task took to complete. Compare actual time taken against the estimate. Over time the data this will collect will feed back into your estimates. You can manage and measure lost working time, productivity and have a real time indication of task status. Each staff member can starts, pause and complete the task on their Task Tracker in the location where they work. No need to have a CRM licence for this these employees so you can give access to all your staff and contractors at no cost! Brings accountability to the process. 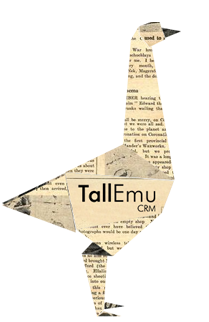 This is a free add-on for Tall Emu CRM. 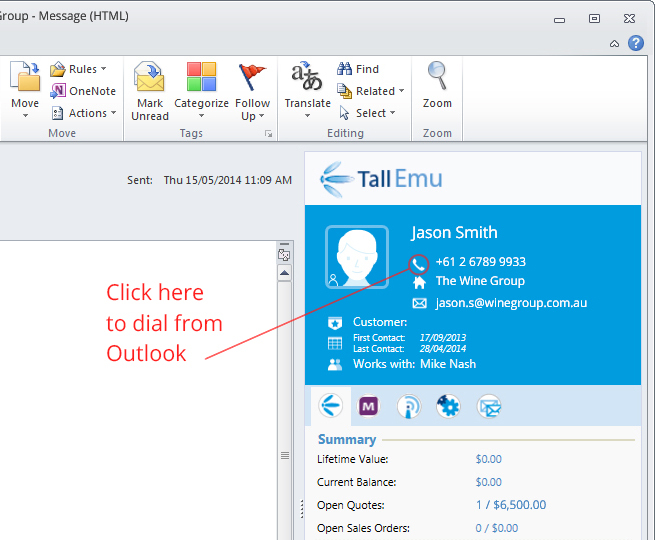 If you have a current Tall Emu CRM licence, there is no charge for this extension[*]. The Web Time tracker allows unlimited employee and contractor access – free. [*] There is no software licence fee for this product, and users are unlimited. You will need a compatible version of Tall Emu, and installation/training/setup fees apply if you do not have a managed support agreement. This entry was posted in CRM Intergations on February 16, 2016 by David Northmore. The potential for automation with Tall Emu CRM is massive and we don’t really make time to tell everyone what type of Automation’s we have done for clients. Here are the most common or recent process automatons, but there are hundreds more we do and can do. 3. Automatically update opportunity status based on monitored events and activity. If there is something in your business that can be automated or if there is a job that is laborious and time consuming then feel free to ask us if we could engineer it out or automate a solution. This entry was posted in CRM Intergations on January 6, 2016 by David Northmore. My first introduction to CRM was Sales Force and the idea for it was a sound one. I was leading a team of consultants that were all working with a portfolio of clients on a retainer basis. So it was important that we knew how many hours that we worked on their behalf so that we were not over or under servicing them. You’ll never get the ROI out of your CRM investment, if you only ever see it as a central database for customer data. We also needed to know what redundant time there was in the team for taking on more work and what sales opportunities there might be out there. I hated CRM…with a passion!! However, I hardly used Sale Force CRM as it just added to my work load. It was my job to enforce the use of the SF CRM on my team and I saw first hand how much of a pain this needless intervention was. It stopped us from doing our work which was consulting and selling our services. So it’s a funny turn of events that all these years later, I now own a CRM of my own. Does that mean the above inherent problem has been resolved? At Tall Emu we are always looking ways of capturing the activity of a company’s staff without the need for them to do extra data entry. The goal of Tall Emu is to develop a CRM / ERP that works for you and is an aide to the work you do and does not turn you into a slave for it. Tall Emu CRM can collect data automatically from lots of different sources and data that tells us a story about what is going on in a business. We also want the CRM to be illuminating, proactive and a worker in the business. It needs to keep people on its toes, like sending reminders to customers to pay, Sales people to call a lead and to automatically send marketing material to potential customers without being asked. If you have CRM or thinking about getting one or just want to work smarter, then think about what would be helpful to each team, business unit or individual staff members in being better more productive in their work. If you just can’t think of what’s possible then that’s when you need to get a third party to look at how you currently work and create CRM strategies and an implementation plan. Buying CRM just to be the central hub for data, is missing the point. You’ll never get the ROI out of your CRM investment, if you only ever see it as a central database for customer data. Success in 2016 with CRM is understanding that the implementation of CRM is more important than the CRM you select and YOU need to ask yourself “how can we work SMARTER not harder”. Do I still hate CRM? Not anymore because my expectations for it are different from what I was told to expect from it. So I am excited about where CRM is going and if you’re not then you might be in need of a conversation with a CRM implementer that gets its. This entry was posted in CRM Intergations on August 7, 2015 by Mike Nash. I received a very excited text message today, telling me I’d just saved a client $80,000 by accident! Given that all I’d done that morning was a few demos of our product, drank a coffee and ordered some Sushi I was intrigued as to quite how I’d managed this. Turns out that a feature of our system (which had indeed been switched on by accident) had kicked in and generated a large invoice. At first there was a little grumbling… “The CRM system’s generated a duplicate invoice” – but the grizzling soon stopped when they checked the accounting system and realised that it wasn’t a duplicate after all. Tall Emu CRM had just generated an invoice for $80,000 worth of product that otherwise would have been missed. Sometimes I don’t think we charge enough. Tall Emu CRM has a nice facility called “Shipments” – which is used to track the dispatch of goods from A-B. It can be from a supplier to your warehouse – or transfers between your warehouses – or from your warehouse to a client. It’s basically consignment tracking right down to the consignment note number, or in the case of importing product from overseas – Bill of Lading numbers. Previously, the client wasn’t using our shipment module. In fact, they’d only started using it recently preferring before to operate their paper-based dispatch process, followed up with manual invoicing. It’s not uncommon – we see many business that run on Accounting System/Brainpower/Paper and Excel. Thanks to recently enabling this feature and starting to use it, a potentially costly mistake was averted! This is just one of the many benefits of businesses integrating and automating their business processes using Tall Emu CRM and their preferred accounting system – paper based processes are eliminated allowing automated cross-checks, reporting and the application of business rules. I think tomorrow I’ll have steak. This entry was posted in CRM Concept, CRM Intergations on May 24, 2015 by David Northmore. You may have heard the saying “death by a thousand cuts”. Well it’s a powerful and relatable concept and most people will know what it means. If you apply this to your relationship with your customers, you can well imagine that their loyalty or patronage may be at risk by a similar dynamic. This Blog deals with the notion that you can tell when a customer is starting to move away from you, BEFORE they do. We will discuss how CRM integration, great reporting and Business Intelligence can help you not get blindsided. Have you ever lost a customer? Realistically there is not a business, no matter how good, that hasn’t lost a customer. This Blog is not focused on “why” they may have left but on how you can detect early, which customers are on the way-out or are doing a lot less business with you. When you have a small customer base this might be quite easy to discern, but as you grow, this becomes hard and you might not ever realise, let alone name the customers you are losing. It’s not ME, its YOU. Here at Tall Emu CRM we are working with some of our customers to spot the customers that are about to “exit left” but haven’t told you yet. When you lose a customer it happen in one of four ways: It can be swift and public, swift and silent, slow and public or slow and silent. We are only interested in the silent death of a customer. Much like a romance that is on its last legs, there are tail-tail signs that together tell the real health of that relationship. Like real life, sometimes, you are too close to notice or are not able or willing to acknowledge it. So how do you “Catch” the customers slipping away before they do? Luckily, we can use technology to keep us abreast of how our customers might be feeling long before they’ve gone forever. If your customers buy more than one product or they buy frequently, then there maybe a pattern to this buying worth monitoring. If it changes in a negative direction would you notice? Another indicator that things aren’t all that rosy, is a drop in communication. This could be less or no emails (received by you or read by them), phone calls received or not returned. It could be by less visits to our premises or if you’re tracking their visits to your website then this too may indicate a mood change. Even customers not opening your newsletters or worse still, unsubscribing, might be a sign that “they aren’t really that into you”. In order to monitor the customer’s interaction with you, you need to have all the touch points that your customer would use to be plumbed into your CRM. Are you automatically tracking in CRM all the phone calls received and made in your business against your customers record? Are tracking your customers when they open your emails or newsletters? Would you know when a customer visited your websites including Blog and Help files? Does your Point of Sale send info to your CRM? Does your Accounting system and CRM talk to each other and share data? Has a good payer of bills started to become a bad payer? Are you tracking the buying habits of your customers including what they buy and how frequent? Have you formulated acceptable KPI for your customer that if they are not met trigger your attention? Do you ever survey your customers and ask them how they are going? Do you ever speak to them or do you do everything via email or not at all? When was the last time you paid them a visit if ever? Perhaps by reading this you’ve thought of a few other indicators that a customer might use to show that they are less than happy or that they have found another to love. If so, feel free to share. The important thing in all this is that you’re powerless, if you don’t have the right structure in your business to monitor and have the knowledge to act. Have every touch points and every system or data source flowing into CRM. Create Reports or Dashboards on the Data that you’ve collected, that reveal your customers’ interactions with you as per some of the of the ways mentioned above. Set up triggers that will alert you to these significant changes against the KPI’s you’ve setup and have a workflow bring this to you or your team’s attention. If you are providing a great service, a great product and at the right price, then a system like this may validate that. However, if you feel that you’re not as across your business as you should be or you don’t currently have the correct infrastructure then perhaps you should speak to one of our Business Analysis to help work out a game plan. Getting customers is an expensive business, so it makes sense that you nurture the ones you do have. While this doesn’t help nurture your customers, it does tell you, who you need to give an extra bit of love to before you get the “Dear John” letter. This entry was posted in CRM Intergations, Uncategorized on January 30, 2015 by David Northmore. We recently launched the new website (which we designed and built) and completed the Tall Emu CRM integration for the premium fresh pasta company, Pastabilities. Here we have listed several articles that have been written about this project. Highly awarded gourmet pasta producer Pastabilities, has gone live with a Tall Emu CRM system and a new fully integrated eCommerce website. Australian gourmet food business, Pastabilities, has gone live with a new Tall Emu CRM system and e-commerce website. Connect your phone system to CRM to save time, money and stress. This entry was posted in CRM Intergations, Why CRM on December 12, 2014 by Mike Nash. Tall Emu yet again brings Enterprise-grade features down to the SME sector with our new phone to CRM link. Our new ‘phone link’ not only tracks and logs calls automatically inside CRM saving you time, manual effort, and it saves you the hassle and the frustration of ensuring staff record these calls in CRM. Since we now have call data on the inbound and outbound call activity in your business, you can easily monitor and report on this call activity with Tall Emu’s Dashboards and the KPI Reporting system (only available in version 3 or above). For most businesses the telephone is where most of the selling activity actually gets done and is usually still the best sales converting tool in your business, so knowing as much as you can about this is crucial. Already running call reports from your Phone System? Tall Emu links the call data directly into CRM against the customer’s record – automatically. Talk time, ring time, abandoned calls can all be seen real-time in CRM. Inbound calls let you know who is calling – and show essential data about that client or lead. Log call outcomes and notes easily over and above the automated logging. This appears when someone calls in, and their number is in CRM. If the phone on the desk is ringing (e.g. ring group) or direct line, this popup will appear. When someone takes the call – this will disappear. If you have more than one line, the CRM will show you which line is being called- ideal if you have sales and support numbers. When the call is answered – the “Smartbar” pops up. It shows purchase history, open opportunities and more – all clickable to open relevant areas of CRM. Each user could choose when and if they want this to open. Options include when the call is ringing, when it is answered, or not at all. Reception may not want the smartbar – but sales… you bet they will. Each user may select their preferred screen. Again – sales may want the “fast quote screen”. Reception may want nothing at all. 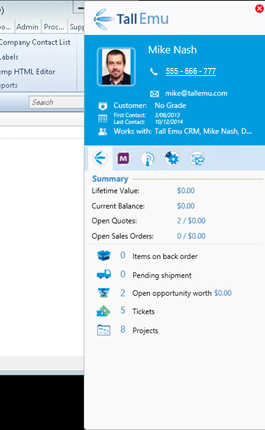 From within side outlook – you can click on the call and it will dial, logging the call automatically in CRM. 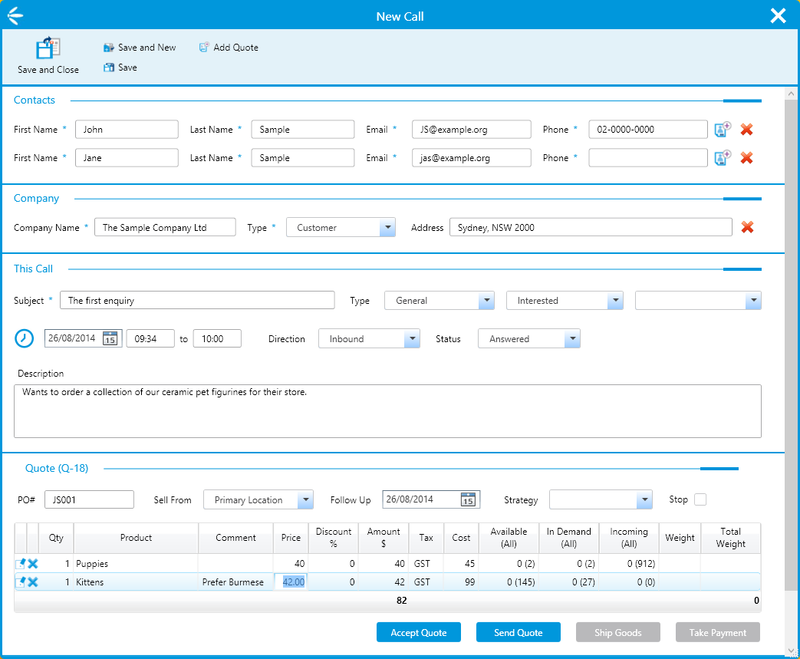 Finally – the new version of CTI automatically creates proper CRM call records – call direction, client, and duration. This can then be reported on in the KPI reporting and dashboards, reviewed against customer records. Tall Emu CRM works with a whole lot of phone systems from NEC, Samsung, Panasonic, Avaya and more. You can see if your phone system works with CRM by clicking here. If your phone system isn’t on the list, don’t be disheartened – the same phone system may be called different things in different parts of the world – just contact us and we’ll help you out. Because Tall Emu CRM is forever developing and usually at the request of our customer, there is no end to what is possible from this new functionality. Idea #1: Set up email notification when a “HOT lead” calls into the office. This is especially useful if you are the Sales Person trying to close the deal but you are busy. You are going to want to drop everything to get back to them. Never again rely on someone taking a message for you. If you have any suggestions let us know. Remember, you need to upgrade to get this feature and to order and pay for a CTI licence. Contact us via our contact form or get in touch with support if you’re interested in our new phone features. This entry was posted in CRM Intergations, Uncategorized on November 3, 2014 by David Northmore. The article is written by Brad Howarth from CMO which is dedicated to the issues and challenges faced by the chief marketers officers in their efforts to align their own practices and insights with those of the business. Port Container Services is a company that never stopped evolving its business, despite their early success. Their future success however, was not assured, due to their inability to scale the business with the business structure of those early days. In true PCS style, they just hit the problem head on and started looking for answers. We are very proud that with our CRM Software and our automation and integration skills, we worked together to create an awesome business system. As a client of Tall Emu they are a test case that big vision, constant engagement and guts goes go a long way in being industry leaders.